Berlin (February 9, 2019) – For the year that has just come to an end MEDIA Salles is able to report cinema admissions in 36 countries: total admissions come to 1,277.5 million, compared to 1,329.1 in 2017, revealing a dip of 3.9%. The hiccup regards both Western Europe (-4.1%) and Central-Eastern Europe and the Mediterranean Rim (-3.5%) and marks a pause in the rise in spectator numbers over several years in this part of the continent. Instead, taking a look at the EU countries, the figures available for 26 of them, excluding Cyprus and Malta, show a less marked decline, settling at around 3.1%. In 2018 there were again countries in which the opposite trend occurred and for some of them record results are to be seen. Of the five leading markets, the United Kingdom did, in fact, record a growth rate of 3.7%, bringing spectator numbers up to 177 million, a level that had not been reached since 1970. France, however, reveals a minus sign but, although losing 4.3%, remained above the 200-million-spectator mark, once again becoming the continent’s top market, since Russia, which had taken over a slight lead in 2017, suffered a more drastic decrease in numbers. Fewer spectators in Spain, too, where the 2.1% hiccup is less severe than the overall average, in Italy, where MEDIA Salles estimates 92 million spectators for screens operating at least 60 days a year, with a drop of 6.9%, as well as Germany, where it is decidedly bigger, coming to -13.9%. A similar trend is to be seen in Switzerland, which closes 2018 with a 13.5% fall. 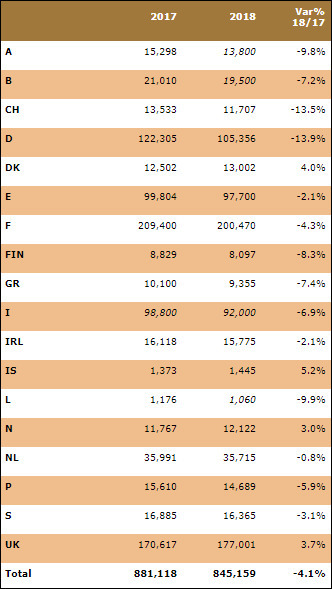 Figures are also on the way down in Austria, a market where MEDIA Salles estimates 13.8 million spectators or -9.8% compared to 2017, Finland (-8.3%), Greece (-7.4%), Belgium and Luxembourg, where the figures have been estimated and reveal drops of respectively 7.2% and 9.9%. The dips are more contained in Portugal (-5.9%), Sweden (-3.1%) and Ireland (-2.1%). The Netherlands remain basically stable (-0.8%) and almost equal the record figures obtained in 2017, well over 35 million spectators, or more or less double the level obtained in the mid-Nineties. A plus sign marks results in Norway (+3%), Denmark (+4%) and Iceland (+5.2%). 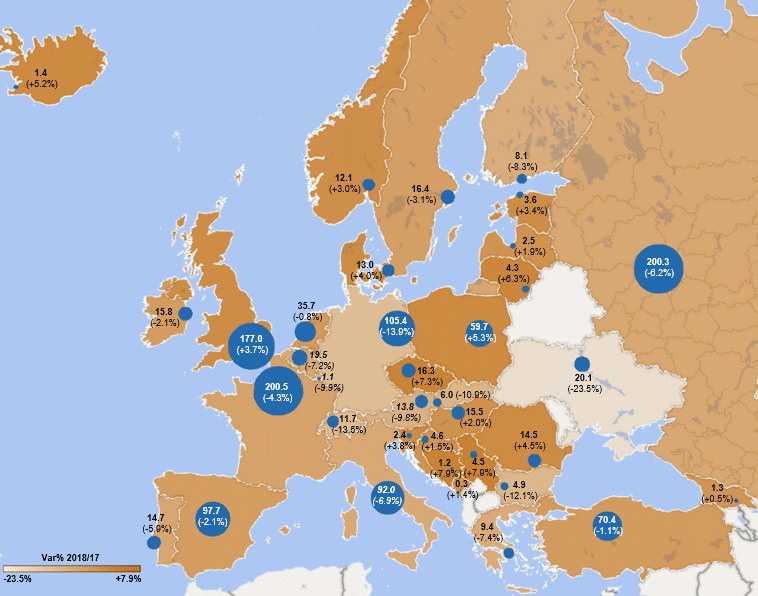 This area of Europe sees the prevalence of a positive trend, which determines authentic records in some countries: this is the case on the large Polish market, touching on 60 million spectators with a 5.3% increase, the Czech Republic, which passes the 16-million-admissions mark (+7.3%), Romania, growing by 4.5% and coming to well over 14 million spectators, as well as Lithuania and the Republic of Serbia. The latter two countries both improved on their 2017 result, when they crossed the 4-million-spectator threshold: the former grew by 6.3%, the latter by as much as 7.9%. Increases in Bosnia Herzegovina also amounted to 7.9%, whilst other positive results – though less striking – were recorded in Slovenia (+3.8%), in Estonia (+3.4%), in Hungary (+2%), Latvia (+1.9%), Croatia (+1.5%), Montenegro (+1.4%) and in Georgia (+0.5%). Audiences are declining, instead, in a handful of other countries, in the majority of cases the mostly highly populated in the area. They include Russia, previously mentioned, which remains above the threshold of 200 million spectators, though losing around 13 million (-6.2%), Ukraine, which takes a dramatic step backwards (-23.5%), and Turkey, which records a dip of 1.1%. 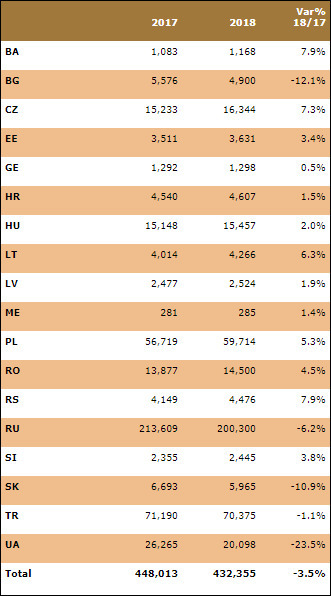 Fewer spectators in Slovak Republic, as well, (-10.9%), which nonetheless records one of its best results for the last few years, and in Bulgaria (-12.1%), a country that falls to below the threshold of 5 million tickets.